Travel West Ukraine Travel West Ukraine: Ukrainian Beehives: So Colorful! If honey-bees in North America are dying out, in Ukraine they doing very well and Ukrainian beekeeping is blossoming. Beekeeping in Ukraine has an old traditions and Ukrainian honey is incredible tasty! There are big bee-farms in Ukraine, for producing a honey for a local market and for export, but also you can find lots of small bee-farms in villages. 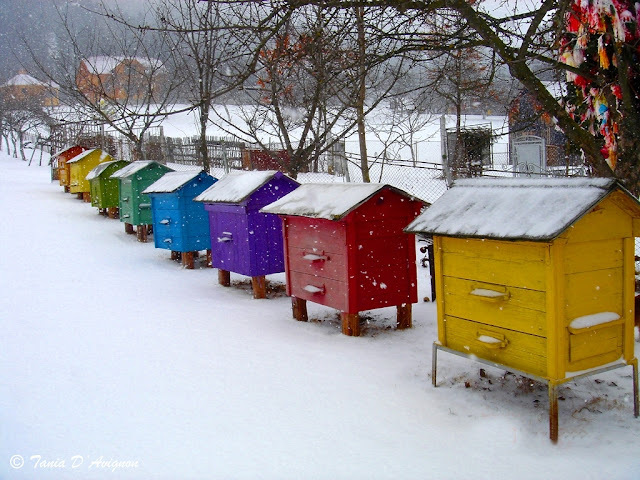 Village people have their own small farms, so if you are traveling in Ukrainian countryside you can see many cute bee "houses" like American-Ukrainian photographer Tania D’Avignon saw and took a picture of those colorful beehives. The Tania’s photo of beehives you can see above, it was taken in Carpathian Mountains (western Ukraine). Two pictures below came from West Ukraine too. First one I took in my trip to Ukraine last summer, near Kolomyya city (Ivano-Frankivsk region). I was attracted by unusual design of those beehives. Another interesting photo of beehives outside of Ternopil city was taken by Olya Sagal’ the journalist from Ternopil city (Olya is a very good friend of mine). She could not resist taking some pictures of those beehives because they are painted in yellow and blue colors. “Yellow and blue are colors of Ukrainian flag, that’s why I wanted to have those photos”, Olya said.